I just finished reading this book and it made my head spin. It sort of goes along with many other books and tapes I've been reading and watching about making serious attitude changes so that I can achieve all the things I want to achieve in life. There is no magic. This is not rocket science. So why is it so hard and terrifying? Because you have to take a leap of faith. It can be a well planned and educated leap, but a leap none the less. And the "leap" may really just be a first step toward whatever goal you (I) want. But why is that step so hard sometimes?! Yowza. Our safety nets are so safe, even if we curse them every day. I don't want to be so "Safe" any more. I am taking the road less traveled. This is the book I'm currently reading. 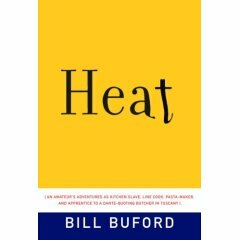 It is a combo of memoir and biography as Mr. Buford relates his cooking (mis)adventures and also tells you Mario Batali's life story. But this is not the book about my future. I love cooking, don't misunderstand. In fact, I made granola yesterday then made crunchy banana muffins with said granola, both from the The Barefoot Contessa Cookbook, which I bought the other day. Tonight we are having salmon for dinner. But I digress. My future, my new brilliant career -- writing and directing. I am currently reading Save The Cat! The Last Book on Screenwriting You'll Ever Need by Blake Snyder. I am two sections in and already my mind is spinning about all the things I need to do with my scripts. My First Movie: Twenty Celebrated Directors Talk about Their First Film by Stephen Lowenstein and Breaking In: How 20 Movie Directors Got Their First Start by Nicholas Jarecki. My new favorite store is Writers Store. Inspiring books fill the shelves and they have lectures and classes about writing. I will become a regular.